Almost finished one of the two remaining levels. -Edited texture for first person model of Alcatraz in the intro submarine. 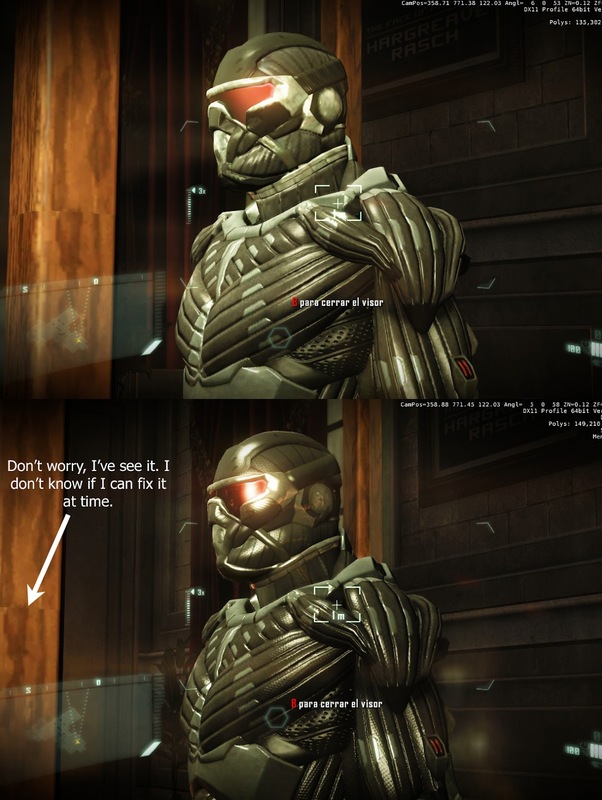 -Edited texture for the nanosuit in the showcases at the "Prism" level. -Casi terminado uno de los dos niveles que quedan. -10% del modo "Teselación reducida"
-Textura editada en el modelo en primera persona de Alcatraz en el submarino. 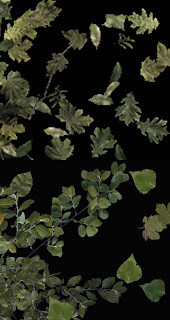 -Textura editada para las hojas verdes del suelo. -Textura editada para el nanosuit de las vitrinas en el nivel "Prism"
Can u give a heads up on the filesize..Actually I hope its big, the bigger the better. @John, bigger is not better. I think now without compression and without final clean, it's around 1.7 Gb. I expect to reduce size in final release. *If i was working at crytek i'd be ashamed and fire myself from crytek. @Bigounet : Why do you want absolutely a big file ? To test your super hard disk or internet connection ? Big files don't make quality. 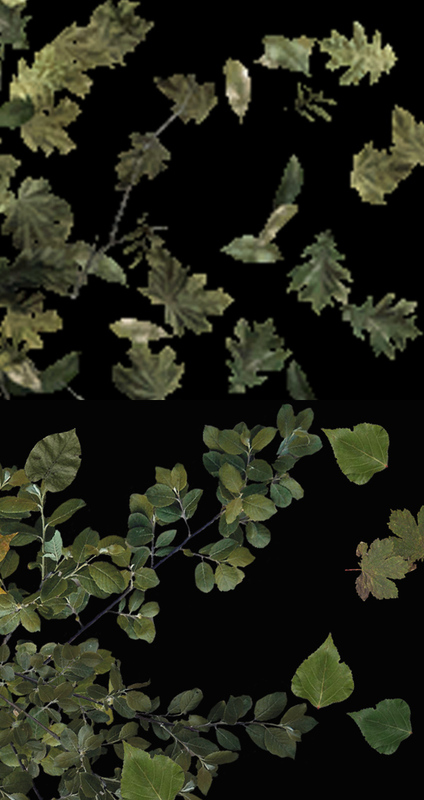 Effects like Tessellation and POM are the main tools to sublimate textures. Texture compression can reduce size without visual loss of quality. And global texture quality doesn't depend of size. If the optimized mod (2gb) is as beautiful as the non optimized (5gb), it's better. More people will be able do download it (I have 512k connection) and texture will take less VRAM so it will run smoother. Merci Maldo t'es le meilleur !!!!!! A texture in 1024 > 256. Stop bitching about the size ffs.This will a HD texture pack so size doesnt matter.If you dont have enough vram then stick the hell to cryteks """"HD"""" pack and stop telling him to reduce quality u morons. Diablow, stop the insults, no one is telling what to do , and reduce quality when we want more quality is a contradiction from you. Maldo you are the best , i never seen a mod like this. Also the config utility is a dream, we can quit tessellation from objects but leave the pom and the tessellation in water. You should try learning to read posts more carefully.I said people should stop whining about texture resolution vram and stuff which could eventually make maldo reduce the quality of his project in order to satisfy those guys.Wanting a outstanding look and complaining about vram related to their 1gb or less cards is simply something I cant stand.The crytek pack is designed for people with 768 - 1gb vram (setup during install) and anyone who wants more has to buy a 1.5-2gb or more card. A quality modder makes no compromise in quality.If you people cant run it on 1gb then stick to the crytek pack or buy a better card which doesnt cost a fortune in 2011.I know this sounds arrogant and selfish but the look matters not you getting it to work with cheap cards. I am checking this page about ever 5 hours. IT'S KILLING ME! Calm down, it's just a mod. The most probably date for release is september 25. Oh and another thing...is maldo 3.0 going to affect multiplayer too cause dx 11 didnt fully affect multiplayer before...some of the things like tesselation were disabled I think..
@John, I have not internet at home so I can't test multiplayer. MaLDoHD 3.0 is all about singleplayer. I don't know how to implement changes in multiplayer because I think this mode is more locked. I've been doing some things with AI and models meshes and there is a very interesting world to discover (and fix). But this mod took many months (that I enjoyed a lod) without being able to play computer games. I want to play. Many games left to open as Witcher 2, Deus Ex, Dirt 3, Limbo, Bastion (I'm waiting internet connection to activate them XD). So probably this version will be the last. But there are many people out there who can do this and much more. Hey baby, you really going to keep this young lady waiting until Sept. 25th. I am ready to make passionate love with you as soon as you finish this mod. @Diablow : I don't have any problem of performance (I have 2gb of VRAM and I would dl 5gb even with 512k). What I wanted to tell is size isn't the main criteria for quality. I am used to play with 4096*4096 textures (mods). I simply said : if visual quality is the same with improved performances or reduced size, then it's even better. It's called "optimization". I didn't say "reduce quality". I am mainly talking about file size, not texture size. Size matters... bigger is better. Don't listen to these kids Maldo. I am a developer like Maldo, not a kid. And Maldo do what he thinks is the best. I was only responding to persons which were disappointed that the mod didn't weight 5-6gb whereas it's wonderful at 2gb (the actual size). It's simplistic to tell that size makes quality. It contributes (to some degree) but a ton of others things (often more important) matter. I lay in my bed naked everyday without food or water until Maldonado releases this mod. I doubt seriously Maldo being attracted by a naked skeleton. What chance do I have of being able to run this pack with 4GB ram on Vista 32 bit, and 768mb of vram?